We see politics in startups as a disease – once it takes hold, it can spread through the company until it kills. So we have a No Politics rule. There are really just two things we do to prevent the disease of politics. First, don’t hire people who are political by nature. You can usually spot them in an interview by asking what they liked or disliked about people they worked with in their prior jobs. You can also spot them by testing how “attracted to drama” they are. By drama, I don’t mean theater, I mean the basic interpersonal push and pull between people and their perceived interests that characterized junior high school and high school, e.g. “Did you here what she said about him? ?” People who are attracted to that sort of thing will create that in their work lives as a way of entertaining themselves. 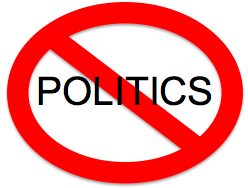 One person I worked with years ago, who dislikes politics, said about another colleague in a shock of realization, “For him, if he goes a day without playing politics, it’s a wasted day.” Some people are wired to create politics around them, and, in fact, some national cultures seem more wired to create politics than others. Watch for it. Second, “expose to daylight” any comment or idea that seems like it’s political. Here’s what I mean. The fundamental particle of politics is the simple act of saying different things to different people. If my VP of Engineering is saying something to me that he won’t tell directly to the Director of Sales, then we have a moment of politics, and the antidote is to have the VP say it directly to the Director of Sales. In my experience, there are typically three main reasons people don’t say something directly to one person that they will say to another. 1) I’m scared of his/her reaction. 2) It’s not going to do any good, anyway. 3) It doesn’t help me, and it may hurt me if I say something. To overcome the fears people naturally have to be honest with each other, you have to show people that it turns out OK when they expose these ideas to sunlight. And you have to do it over and over again, because it’s so easy for us to fall out of genuine, open communication. Thus, having No Politics starts at the top of your organization. Look for CEO’s who force daylight through the organization. Some might say that you can’t get rid of politics entirely for the simple fact we all engage in politics at least a little bit (because we all have our points of view, our fears, and our ambitions). And that’s true. But I believe you should make No Politics your policy. It makes a big difference in how effective and enjoyable your work environment is. Rock on Jim. So very true. Well is it really possible to eliminate politics from the office? The very method used to hire people involves politics in one form or another. Haha. Kind of ironic, no? But yes, I definitely agree about the dangers of politics/interpersonal drama. And it’s quite true that one must constantly and consciously refuse it to successfully stop its spread.